If your website design is not mobile-first, you are neglecting a huge percentage of your audience. More than 50 percent of internet access comes from mobile devices and this is only going to increase as time goes by. Mobile-first designs help attract a younger audience and simplify things for the older generation. Moreover, as millennials have become the largest demographic in the United States, designing with mobile in mind will help them better connect with your site. Surveys show that if you want to connect with the new generation you should be thinking mobile-first. Designing for mobile means your site should be fast, simple and easy to use. This is the first step in creating an engaging website for your community. ADA compliance is a hot topic and has many local governments on high alert. However, making your website ADA compliant is not as daunting as it seems. It also helps those with disabilities feel included when they visit your site. Over the course of 2018, there has been a 30 percent increase in lawsuits against non-ADA-compliant websites, bringing the total number to more than 10,000 lawsuits. This is only the beginning. Attorneys are exploiting those that are non-compliant and using this to demand monetary settlements that well exceed the cost to become compliant. Do not let this happen to you and your community. Government website hacking effects nearly 45 percent of websites on a daily basis. This is just what we are aware of now. Local governments sometimes do not take the threat of attack as seriously as needed. HTTPS and firewalls should be standard whenever you are setting up or redesigning your website. Cybersecurity can be a very difficult and technical subject that does not make much sense to your average government employee. A reputable provider can provide the security to give you peace of mind that your community is safe from cyber-attacks. So you know your website works on mobile devices, is ADA compliant and secure. Now what? Maybe the most important aspect of your website is the overall design. Although it may not be necessary to the site’s function, in the eyes of the end user, the design is how you will be judged. Design trends point to a simple, clean and easy-to-use website. Using video backgrounds, mega-menus and news centers are just a few things you can do to make your website beautiful. These are just some of the things your website must have to be successful in 2019. Remember, there are many aspects to consider when it comes to your website design. As we begin 2019, if your website is not up to date, this should be at the top of your list of things to do this year. 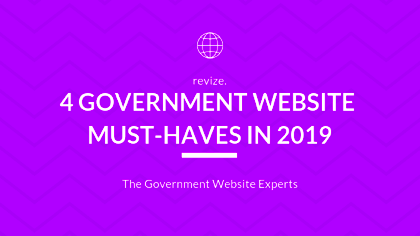 When choosing a company to build your new website, go with one with years of experience, secure hosting and an easy-to-operate content management system (CMS), to list a few, like Revize: The Government Website Experts. Author: Scott M. Field is a United States Army veteran and marketing specialist. After serving in the military, Scott went on to study business in San Francisco. After college, Scott worked in the technology industry conducting marketing, advertising, and business development. Currently, Scott works for Revize: The Government Website Experts as their marketing specialist.